(Bloomberg) -- Tiger Woods’s stunning victory at the Masters on Sunday didn’t translate into a larger TV audience for CBS Corp. after an earlier-than-normal start meant some viewers were probably still asleep when coverage kicked off. With the exception of the British Open, major golf tournaments usually air in the afternoons on the East Coast. Sunday’s final round started early because tournament organizers wanted to avoid bad weather approaching Augusta, Georgia. Still, the 7.7 rating marked the highest rating for a morning golf broadcast in 34 years, CBS said. Woods, who was playing in the final group, teed off at 9:20 a.m. on the East Coast and wrapped up before 2 p.m., causing CBS to potentially miss out on West Coast viewers who didn’t wake up early. Each rating point equals 1 percent of U.S. TV households. 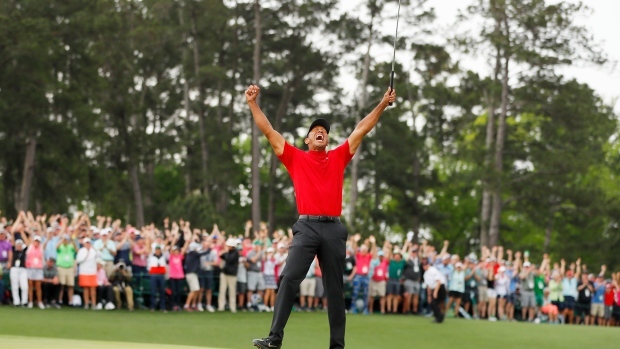 The 43-year-old won his fifth Masters title on Sunday by one stroke, capping a remarkable return to the top of his sport after a decade marred by marital trouble, substance abuse, multiple surgeries and inconsistent play. It was his first major victory in over a decade and just his second PGA Tour victory in more than five years. A total viewer number is expected to be released later Monday.